Our high end wedding dress restoration services truly set us apart from our competition. We are so honored to work with these treasured family heirlooms and each one is a valued project. 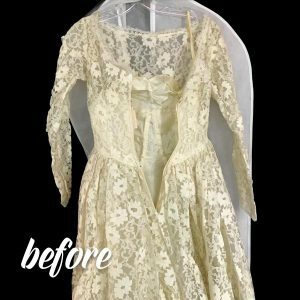 We work diligently to inspect every aspect of the antique wedding dress and do our best to communicate final bridal dress restoration outcomes with our customers prior to wedding dress cleaning. Our experience shows that we do have great success with older fabrics and often we can brighten the fabric up where appropriate. On aged staining, we also run tests when needed and will communicate expectations with customers. We work hard to set expectations related to the aged beading which does need to be protected. Often elements of bridal dress restoration dresses such as beading have compounds that break down over time, giving the beading an aged look that is irreversible. We will communicate that with our customers as well. 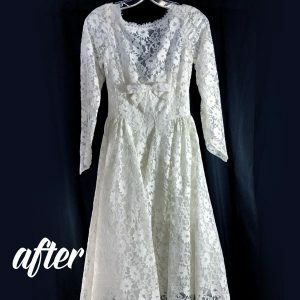 Each wedding dress restoration project is special and handled exclusively by our master dry cleaner. It’s very rewarding to see these precious family heirlooms come back to life. The dress would normally come back in a wedding dress muslin bag. However, with wedding dress restoration projects we normally recommend consideration of our wedding dress preservation services with our wedding dress preservation box.